Australia has filed a formal complaint with the World Trade Organization that accuses Canada of placing "discriminatory" rules on the sales of imported wine. Canada is Australia's fourth-biggest wine market. Officials in Canberra say rules in Canada unfairly discriminate against overseas wine. An official protest has been lodged with the World Trade Organization (WTO) against regulations in the Canadian province of British Columbia, where wine produced locally can be sold in grocery stores but imports must be sold in a "store within a store" with a separate cash register. Canberra's objection also targets policies in other provinces, including Ontario, Quebec and Nova Scotia, as well as federal practices in Canada, which could breach a WTO agreement. They mean higher prices for foreign wines, as well as other barriers to sale, according to the Australian complaint. 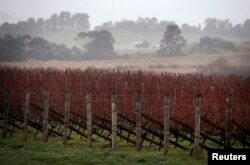 Australia’s complaint to the WTO is similar to one made by the United States, which has accused Canada of placing unfair limits on the sale of imported wine. FILE - Rows of vines can be seen at an Australian winery. In October, the U.S. said British Columbia was favoring local vineyards by giving their wine an exclusive retail outlet in grocery store shelves and cutting out U.S. competition. A spokesman for Canada’s international trade minister said the federal government works to ensure its liquor policies “are consistent with our international trade commitments”. Under WTO rules, Canada has 60 days to settle the dispute with Australia. After that, Canberra could ask the WTO to adjudicate, which could result in Canada being forced to change its laws or risk trade sanctions.